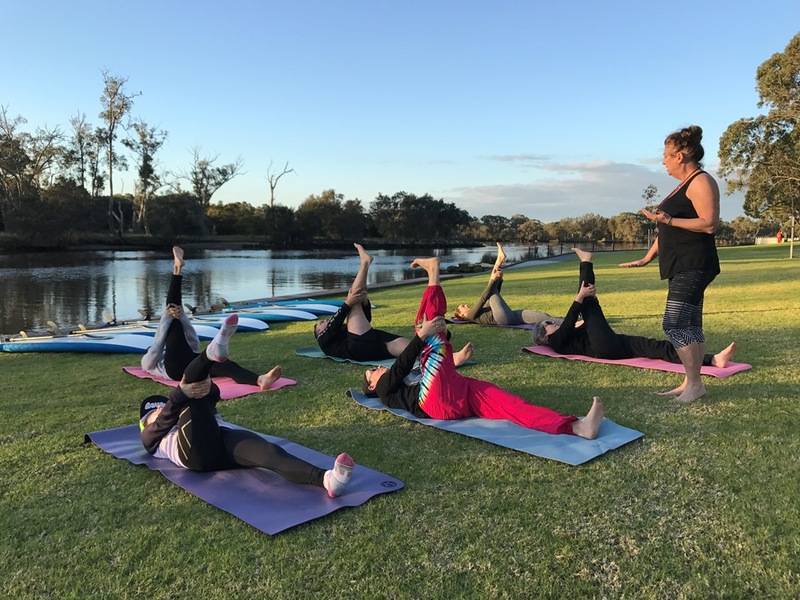 We are very happy to announce our new “twilight Chill” Yoga and SUP class to be held at Garvey Park, Ascot offering one of the most tranquil river settings in Perth. Maree and Corry have joined together to bring you the harmonious combination of land based yoga and stand up paddle boarding for beginners structured to bring us back into balance and disconnect from routine stress. Our aim is to take you on a beautiful mid-week journey of unwinding through gentle land based movement then onto the water for a gorgeous glide up close and personal with nature learning basic SUP skills and safety awareness. Classes are structured as a six week programme or you can book on a casual basis. For more information, prices and to make your booking please go to the packages page and submit your enquiry. I discovered yoga about five years ago when I moved to Maylands and gave up a stressful Fly In / Fly Out lifestyle. My only regret is that I didn’t find it sooner in my life. Not being a huge fan of cardio exercise, yoga appealed to me on many levels. I loved the beautiful movement with breath and the feeling of being centred and energised at the end of a class. I was lucky to find an amazing teacher and went on to attend several yoga retreats, both in Margaret River and Ubud. The ability to totally immerse yourself in yoga for a length of time is such a gift. My teachings since then have included corporate staff classes, corporate workplace meditation, facilitating classes at meditation retreats and my summer beginner’s classes by the river in Maylands. I now look forward to the opportunity work with Maree from SUP Tonic Australia to combine two loves – yoga and stand-up paddle boarding and being able to share that with our clients.